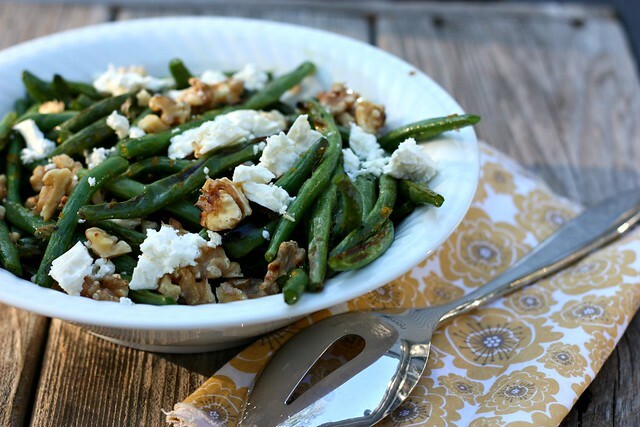 Blistered Green Beans with Feta and Walnuts – Elly Says Opa! If you ask either of my kids their favorite vegetable, they will respond green beans, without question. The amount of green beans those two can take down is borderline crazy. Most green bean recipes call for a pound of green beans to serve 4 (adults, presumably), but in this household usually make at least 1.5 lbs., with the kids eating at least as much as the adults. We have to get out THE BIG PLATES on green bean nights. That said, I’m pretty boring and basic with how I cook them. Ninety percent of the time I blanch them and then quickly saute with a little butter. Sometimes I roast them, if I already have the oven on for something else. Recently I discovered an amazing “trick” where you can use the pan you used to cook your protein to saute and steam the green beans and this has been eye-opening. Yes, I know this sounds ridiculous, but cleaning fewer pans? Sign me up, always. Recently Cooking Light had a feature on a few different and easy additions to green beans and I’ve already tried a couple of them. It may seem like a no-brainer to just add…stuff…in order to make a common side dish different, but I’m not always great with focusing on side dishes. These particular green beans are quickly broiled and then tossed with an orange vinaigrette, feta, and toasted walnuts. They are different, but not CRAZY different. Ian, sadly, does not like feta cheese (😭) so his portion didn’t have any. But both kids ate the requisite amount of approximately 150 green beans. Preheat the broiler to high and place the oven rack in the closest position to the broiler. Toss together the green beans, 1.5 teaspoons of the oil, and salt and pepper to taste on a rimmed broiler-proof baking sheet. Broil for 5 minutes, checking and tossing occasionally, until lightly charred and tender. In a large bowl, whisk together the remaining 2 tablespoons of olive oil, parsley, orange zest and juice. Stir in the beans and the nuts. Season to taste if necessary. Top with the feta before serving.